The spectacle in India is riveting: virulent anti-Muslim diatribes spouted by a pedigreed and ambitious young Hindu politician who shares the surname of the world’s foremost apostle of non-violence and who is descended from the Prime Minister who founded modern India as a secular state to serve the country’s multiplicity of faiths. Since early March, Varun Gandhi, 29, has been the scandal of India’s political class after he called for, among many things, the hands of Muslims to be cut off if they are raised against Hindus, their throats to be slashed, their population to be culled by strict birth control. His words triggered India’s stringent National Security Act, and for days the young Gandhi was a fugitive from the law. The episode has highlighted the ugly feud that has split India’s historic First Family for years. 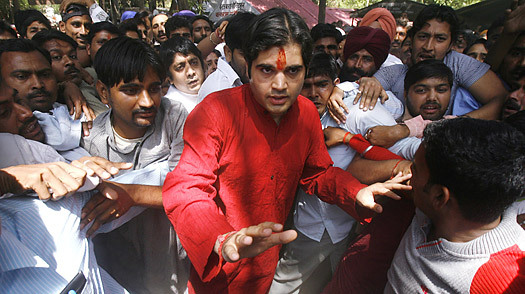 Varun Gandhi is the great-grandson of Jawaharlal Nehru, the country’s first Prime Minister. His grandmother was Nehru’s only child, Indira Gandhi, whose two sons, in turn, left legacies at odds with each other. The older son Rajiv, succeeded his mother as prime minister shortly after she was assassinated in 1984. Rajiv was later murdered in a 1994 terrorist bombing and his Italian-born widow, Sonia, now leads the ruling Congress Party. Rajiv’s younger brother, Sanjay, however, had been their mother Indira’s favorite and had been viewed as her heir apparent until his sudden death in a plane crash in 1980. Sanjay’s widow Maneka is now Sonia Gandhi’s implacable enemy. Maneka and her son Varun are now members of the Hindu nationalist organization, Bharatiya Janata Party , the most ferocious rival of Congress as well as Nehru’s secularist tenets. Many Indians are appalled not only that a descendant of Nehru is espousing such a political perspective but that his name and actions besmirch that of the great Mohandas Karamchand Gandhi, who was assassinated by a Hindu extremist in 1948. While the Mahatma was not a blood relation of the Nehrus, a popular story has the philosopher of political non-violence, who was Indira’s godfather, allowing her fiance, a young Zoroastrian lawyer originally called Feroze Shah Ghandy, to restyle his surname as Gandhi, thus attaching prestige to a mixed marriage many Hindus would not have approved of. Priyanka Gandhi, Sonia’s daughter, said that her cousin Varun’s comments were against the traditions her family had “lived and died for.” There might have been a bigger political spectacle if Priyanka’s brother Rahul had been entered as a possible Congress candidate in the coming elections, but their mother nixed that suggestion. It remains to be seen how the case of Varun Gandhi will affect the BJP’s chances. In any case, his supporters have not been quiet. On Saturday, after he turned himself in, they fought a pitched battle with the police and laid siege to the jail. Police responded by firing tear gas shells and charging the demonstrators with canes, injuring 25 people. His mother Maneka further stoked the anger when she claimed a Muslim officer had led the charge. In India’s often overheated politics, the Nehru-Gandhi dynasty knows about playing with fire.